Where can you go to buy locally sourced groceries, hang out with friends, have a fresh cup of espresso, grab a beer, hear good music and eat breakfast, lunch or dinner all under the same roof? As you try to imagine what sort of establishment might be able to pull all that off, you’re probably thinking it has to be a large location or national chain. Well in Austin, that’s just not the case. Turns out, we have quite a few places that bring all these things together in a one-stop-shop for the surrounding community. You’ve probably heard of a couple of them, like Whip In and Quickie Pickie. 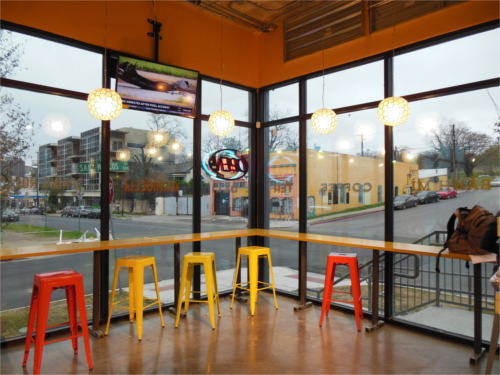 These types of stores/restaurants seem to be becoming a trend in Austin. They’re the result of a conglomeration of concepts from around the world like the American general store, the Indian dhaba, the Spanish bodeguita and others, but with a distinctive Austin vibe. General stores were a big part of American life in colonial days and on the western frontier, mostly because there weren’t any other stores or restaurants within a day’s journey. They started to fade away at the beginning of the 20th century after the invention of the automobile. But back when they were essential, general stores not only provided consumer goods to the community, but they were a place to shop, eat, drink and just hang out with neighbors. What’s interesting about this trend now is that it’s happening in a city. These mixed concept stores are serving Austin neighborhoods as a general store might have served a rural community in early America. Many of their products are locally sourced or organic, and their managers listen to community members to give them what they want, whether food, wine, beer or a comfortable place to spend time. So, while the places we’ve selected to feature here sell groceries as well as serve food and drinks, they each do so in their own unique way. These businesses are all doing a fabulous job of serving their communities and keeping Austin weird. 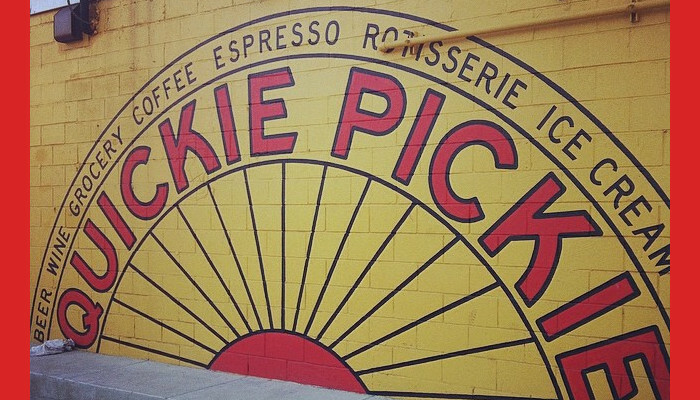 The Quickie Pickie over on East 11th Street has become a favorite hangout for many Austinites living or working in the area. This one stop shop used to be a regular old convenience store until Zahir Prasla bought the place and hired general manager Mohammad Walid to help reinvent it. They were tired of the traditional convenience store concept and wanted something with a more relaxed ambience. They were also aware of the transformation at the Whip In. The Quickie Pickie is now a completely different store with a dog friendly patio, great music and beer on tap with a rotating selection every day. All in all, they rotate around 400 different beers, many of them local. They also sell 300 different boutique wines and they’re always willing to give someone new a try. 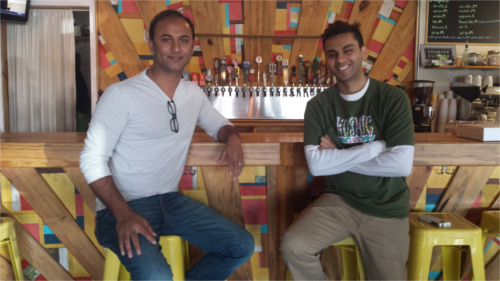 Zahir and Mohammad opened the new Quickie Pickie in May 2013. Before that, they told me, the corner was dead. There was no activity and they wanted to bring something new to increase the foot traffic in the area. As anyone can see now, two years later, they seem to have accomplished their goal. Both of them readily accept products from local vendors and try to buy and sell local first. As anyone who frequents the Quickie Pickie knows, it’s great to be able to get a fast, healthy snack when you want a quick bite. Most everything they sell is local or organic, and the food they make in the kitchen is all from scratch. This includes their soups, salad dressings and breakfast tacos. Zahir and Mohammad will begin construction on a new Quickie Pickie on East Cesar Chavez in fall 2015. The new store will be located at the corner of Anthony Street and will be similar to the old Quickie Pickie, but with a larger outdoor space and larger seating areas. They want to provide a place where the community can feel free to hang out and stay a while. There will be a dog friendly backyard with a playground for kids, live music at times and free Wi-Fi. They were both adamant in saying that it is thanks to the community that they have been so successful, and it seems they do pretty much everything they do in an effort to serve their customers. Zahir proudly stated that with this store model, he can now employ 17 people, whereas before in a traditional convenience store model, he could only employ two. He looks forward to providing even more jobs in Austin. The first time I walked into the Whip In, I felt I had been transported to a pub the Beatles might have created in India circa 1968, had they felt the urge. Someone was playing a guitar on the small indoor stage consisting of a piano and an oriental rug. Brightly colored Indian fabrics lined the walls, Indian ale was plentiful and the smell of curry lingered in the air. Whip In has been around since the 1980s, but fairly recently evolved into what it is today: an Indian restaurant/pub/market/live music venue. They have 72 beers on tap, most of which are craft or local beers. They also have a great wine selection and serve wine by the glass. Buy one of their many bottles, and they’ll uncork it for a fee. They serve Austin-inspired Indian food – how else could they come up with queso with cilantro chutney? In.gredients is a community grocer that opened on Manor Road in 2012. It’s a place where people can buy local and organic groceries in bulk and fresh produce. They also sell pizzas, sandwiches, tamales and more. Their menu changes all the time according to what’s in season and which local products they’re selling, so they don’t currently provide a menu on their website. They do serve local beer on tap and have a great outdoor space where people can hang out and have breakfast, lunch or dinner. 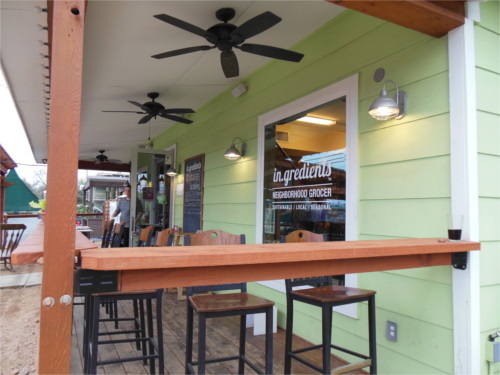 In.gredients also hosts events like Trivia Night on Thursdays and live music during what they call their “Porch Sessions.” Check out their site for upcoming events. Royal Blue Grocery is a small Austin grocery chain that serves the downtown community. They now have a total of five locations, each differing slightly in its offerings. These stores provide groceries, fresh food to take out or eat in, Stumptown coffee on tap, wines by the glass and more. You can buy any of their bottles of beer or wine and drink it in store. The Nueces location has a wine tasting every first Thursday, and they provide hors d’oeuvres with the wine samples. They also serve East Side Pies. All locations are open until midnight every day. 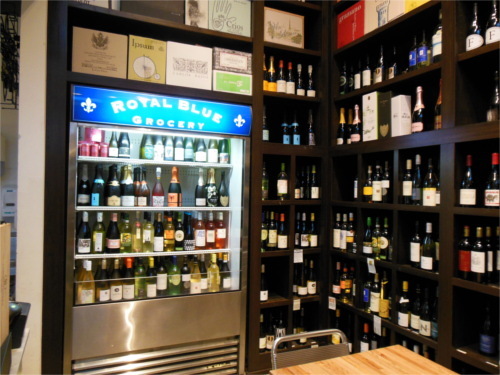 If you haven’t been to a Royal Blue Grocery yet, you should definitely check it out. Bee Grocery is a dine-in convenience store on East 6th and San Marcos Street that just opened last week. 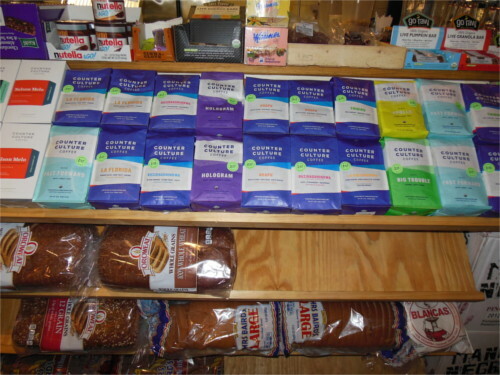 They sell typical convenience store items as well as some local products and produce. They also have a bakery in-house. They specialize in French Vietnamese food and make Bhan Mis, croissants, sweets and other breads. Stop in for an espresso and croissant for breakfast, or a Bhan Mi or vermicelli for lunch. Even though these guys don’t have a license to let people drink on the premises (they chose to sell lottery tickets instead), they do have quite a large beer and wine selection. 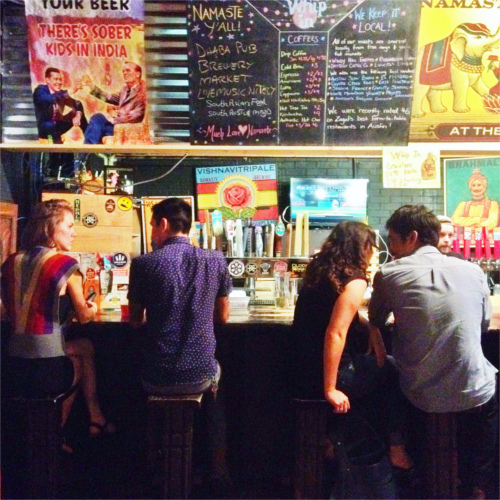 Are there any other local convenience store+restaurant+bar+hang out locations in Austin we missed? Share your favorite in a comment! From the mountains of Jalisco to the snowdrifts of Milwaukee, Natalie Novosad is once again an Austinite and loving how the view changes with new eyes. She’s first and foremost a writer, then a translator and lastly a chef by domestic standards. What makes her happy? Variety, debate, discovery, yoga, spices, travel, music, and sharing life with her Tapatío husband and their beagle-child.